Yesterday I wrote about grit. A big part of GRIT is knowing how to roll with the punches. For me rolling with the punches is about developing inner strength. It’s a muscle we have to train so that when it’s time to use it, we’re prepared. And really the best inner strength is a combination of confidence and calm. 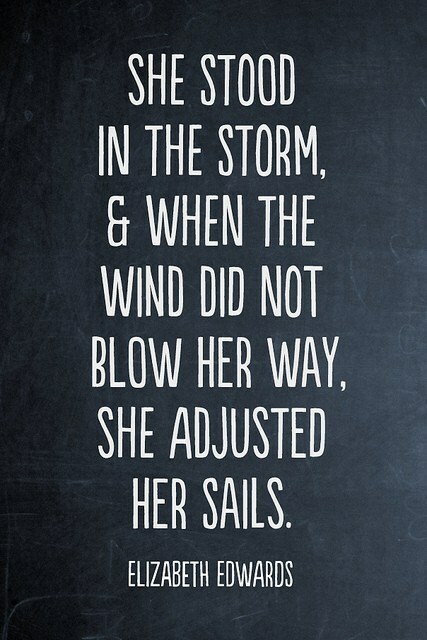 It’s about adjusting your sails to keep moving. Today was crazy by so many standards. Several weeks ago I was distracted. It happens. I got out of the car to bring Ally into her pre-school and forgot to grab my bags. It only took 30 seconds in broad daylight and my world was turned upside down. With all the HSE experiences I’ve had over the years and I became a victim. The thieves took my things and more significantly, my identity. Identity theft is the pits. Most of us have had credit card fraud. It pales in comparison to having your bank accounts raided. It took 3 weeks to have the money restored after conscious inner strength to battle the big bank and its bureaucracy. For weeks I’ve been building a binder of evidence, making calls, and getting re-routed. Just when I though the red tape was done, I had to go downtown. The State Trooper told me to go to the Houston Police Department. HPD said I should go to the courthouse. The courthouse said go see the District Attorney’s office. The DA said go to the ID theft division. That department with crazy disdain finger pointed at me and insisted I go to the Sheriffs office. Now that’s “civil service” for you. And of course, upon leaving to visit the Sheriff’s office, I have a bright shiny ticket on my car because the meter was broken. But I kept my eye on the ball. I ran the marathon, despite how slow it seemed. As I ended my day, all in total I spent nearly 8 hours chasing my tail. The Sheriff’s clerk motioned me to come to the window. I pulled my binder out to give her what she asked for. What do you to build your inner strength? Sometimes, when it rains IT POURS. You know when its bad – your friends’ tell you that you just have had some bad luck. Along the journey everything you know and believe will be tested…over and over again. The silver lining for some of us, these circumstances give way to utterly unexpected and amazing growth and accomplishments that honestly would not have happened had we not been forced to test and exercise what is inside of us.